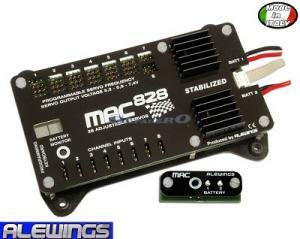 MAC828 is a power supply unit of managing board radio system completely programmable. It handles in input double battery packs Io.Li Li.Poli of 2 cells and 8 channels from receiver. It is equipped of a double electronic switch managed by a button and an external panel with a double charge indicator with battery status of memorization. The real batteries voltage are readable on the display supplied. The power tension of servos is stabilized and programmable at 5,3V or 6V 36A. The receiver tension is stabilized to 5V 1,5A. It is equipped with active filters and protections for short circuits on every 28 outputs of servo-controls. It is equipped of 6 channels for 4 outputs and 2 channels with double output completely programmable in the rotation, centre position and end run. The newest system of servos programming and frequency of piloting analogic and digital servos.